What Types of Kitchen Countertops Are Available? The granite countertops are installed in a single day from a series of pre-cut pieces that are joined together to form a nearly invisible seam. Our granite, Sedona Sunrise� is a mix of tans, whites and browns that compliment the color scheme of the kitchen, while offering a bright surface. There are many options for countertops in today's market, products like Corian, Zodiac quartz, granite, stainless steel, butcher block and even laminate offer an array of price points and functionality for any budget or application. Corian, an engineered, non porous material that is easy to clean and has a designer look available in many colors. Zodiac quarts is also an engineered material that has an appearance like granite, but is more resistant to staining and Is less porous, making it easy to clean. Stainless steel is a classic material used in commercial kitchens or fine homes that is resistant to damage, easy to clean and maintain. Butcher block is typically made of small cuts of thick wood, joined together to form a solid piece that is often used for work areas built in to counters, as it is perfect for a cutting surface. Laminate countertops are typically particleboard that has a plastic coating and print laminated over it, making a very in-expensive and easy to replace solution. We choose granite for classic look, appeal and value. Though granite is a natural stone that must be cut and polished, it offers a unique pattern and style that is hard to reproduce with natures beauty. 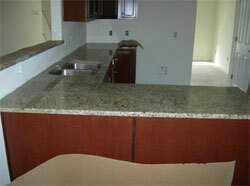 Thought more care and maintained is required, we feel the “luxury and look” of the granite is well worth the effort. Whether you are furnishing your new home or you are doing a remodeling project, one of the most difficult and stressful tasks is shopping for kitchen countertops. There is a wide range of options. It will be much easier to categorize the kitchen countertops according to the type of material. Every material has pros and cons that you should weigh carefully to find the one that will work best for your needs and preferences. Metals like steel are often used as home furniture. You can find a kitchen countertop that is made from steel. It will surely embody the best features of steel such as durability. It will also be easy to maintain. On the other hand, it will also show the disadvantages of steel. It will be noisy when things are placed on top of it. It is also prone to dents. Wood is also frequently used for kitchen countertops. Butcher block is a common term used for wood countertops. The most commonly used types of wood are oak and maple. There are many options when it comes to finishes. A disadvantage of wooden kitchen countertops is that wood requires high maintenance. For instance, scratches need to be oiled and the stains need to be removed and refinished after normal wear and tear. However, this is also an advantage. Other types of kitchen countertops will need a replacement once damaged. In the case of wooden kitchen countertops, one can first opt to sand and refinish. Another disadvantage of untreated wood, improperly installed or poorly manufactured wooden kitchen countertop is that it can be easily damaged by water. Ceramic countertops are less elegant than granite, but they are more affordable and just as durable. This is a good choice if you are looking for an easy to clean kitchen countertop. The price of ceramic countertops varies widely, but it is usually less expensive than granite. The ceramic kitchen countertops have a few disadvantages such as uneven surface and complexity of installation. Ceramic tiles are installed piece by piece with the use of grouts so you can expect to face problems that are associated with grouts such as stains and molds. Granite countertops are elegant and pricey. However, the competition in the industry has significantly lowered the prices. It is a good choice if you want a kitchen countertop that can stand heat excellently. It is very strong. In fact, it comes second to diamond when it comes to hardness. There is also a wide range when it comes to color. A granite countertop may also be maintenance-free when treated with sealers. However, you will need to maintain unsealed granite countertops because they can be easily stained. Marble is another material that can be used to make kitchen countertops. However, only a few homes have a marble countertop mainly because of the high price. It is one of the most expensive materials for kitchen countertops, but the price is surely worth its elegance and durability. It is waterproof and heatproof so there is nothing to worry about except stains and scratches. The marble kitchen counters can easily get stains and scratches unless sealed. Some kitchen countertops can be made from engineered stone, which is made up mostly of quartz particles. There are many options in colors. Its surface is also scratch, acid and stain resistant. It does not need yearly maintenance (i.e. sealing). However, it does cost a lot. A concrete kitchen countertop's main advantage is flexibility. In fact, you can customize the shape of the countertop if you choose concrete. Oftentimes, concrete kitchen counters are casted right at your home. Another advantage of concrete kitchen countertops is that it is resistant to scratches and heat. It can also be free from cracks when professionally treated. On the contrary, a concrete countertop is not your option if you are on a budget. You will spend a lot of money on custom work. Kitchen countertops come in all kinds of different materials and colors, but what it really comes down to when making your final decision is your budget and your style.